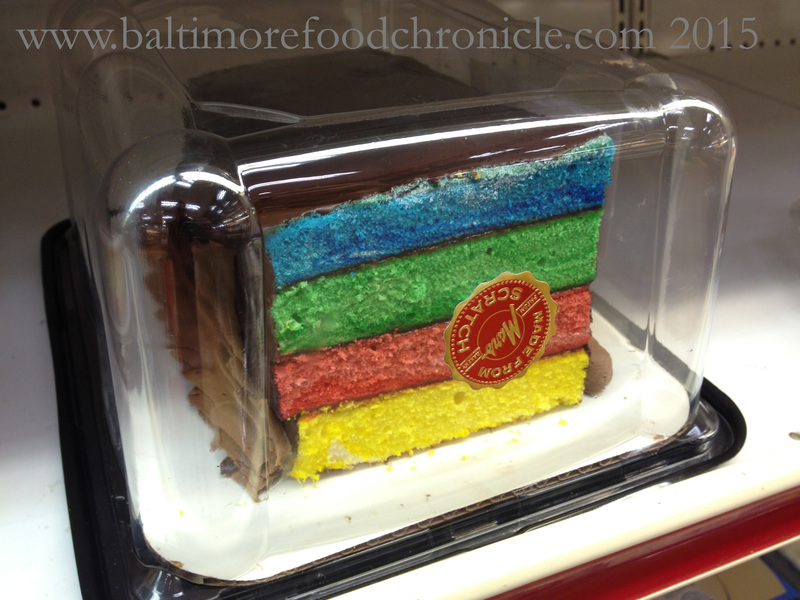 I truly had no idea that Rainbow Cake, sometimes called Ribbon Cake was a uniquely Baltimore cake. 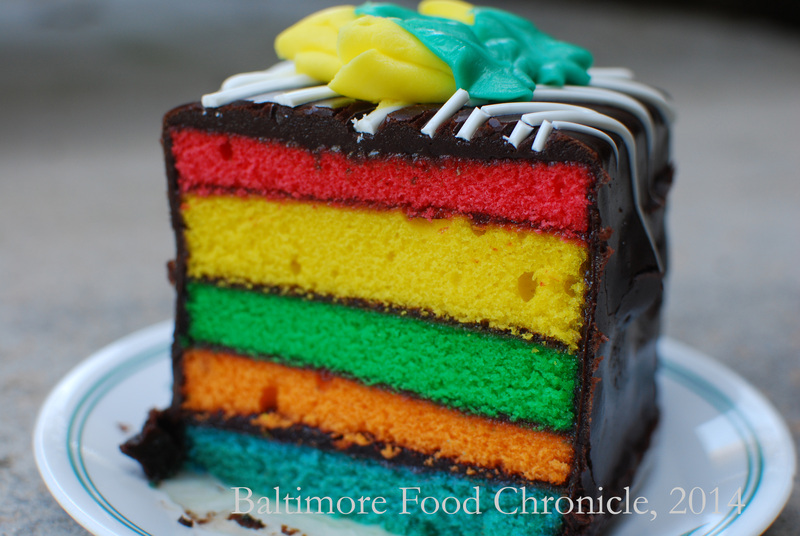 Emerging in the early 1900’s according to Food Historian Gil Marks, Rainbow Cake along with Red Velvet Cake, Lady Baltimore Cake and Smith Island Cake comprise some of Maryland’s own cake creations. As usual, I was looking in the cake case at the Pennsylvania Dutch Market and noticed the commonly found Rainbow Cake sitting inside waiting to be devoured. I see these cakes often, but mostly at our local groceries and bakeries such as Mars or Lexington Market but in all honesty had never really had one. It always just seemed like regular cake. But rainbow. So I turned to Internet and asked him about Rainbow Cake. 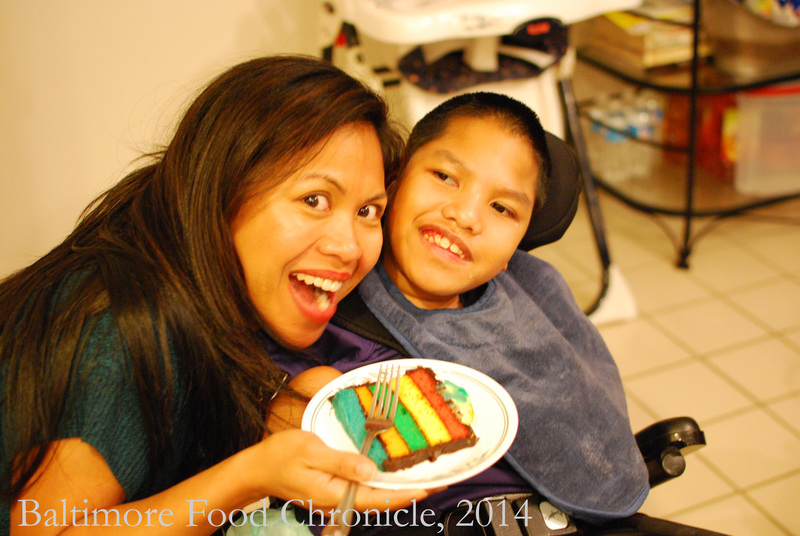 He didn’t find too much, other than some anecdotal stories of Rainbow Cake in family histories, and a once famous bakery named Silbert’s that was reknowned for their version of this treat. So of course this made me want to eat it. As I thought about where to get one, I wanted to go to get a slice (or whole cake) from the Berger Bakery stall at Lexington Market but was too lazy. And I thought about our local grocery but wasn’t even sure if they would have them all the time. So I waited until the first Thursday I could, and visited my Amish friends down the road. And when it came time to buy one (really to taste, but also to photograph and post) I could have picked up a single slice but opted for a whole (albeit small, but whole nonetheless) cake instead. And it is great. The cake itself was moist, but not too thick. Very much like yellow cake but of course dyed various colors. Coated in chocolate icing and separated in layers by a very thin layer of raspberry jelly it was everything I hoped it would be. Those Pennsylvania Dutch know how to make some sweets (and meats). So next time you’re in Baltimore, or if you are already in Baltimore and are curious about this magically delicious concoction of orange stars, yellow moons, green clovers, blue diamonds and red balloons give it a try.